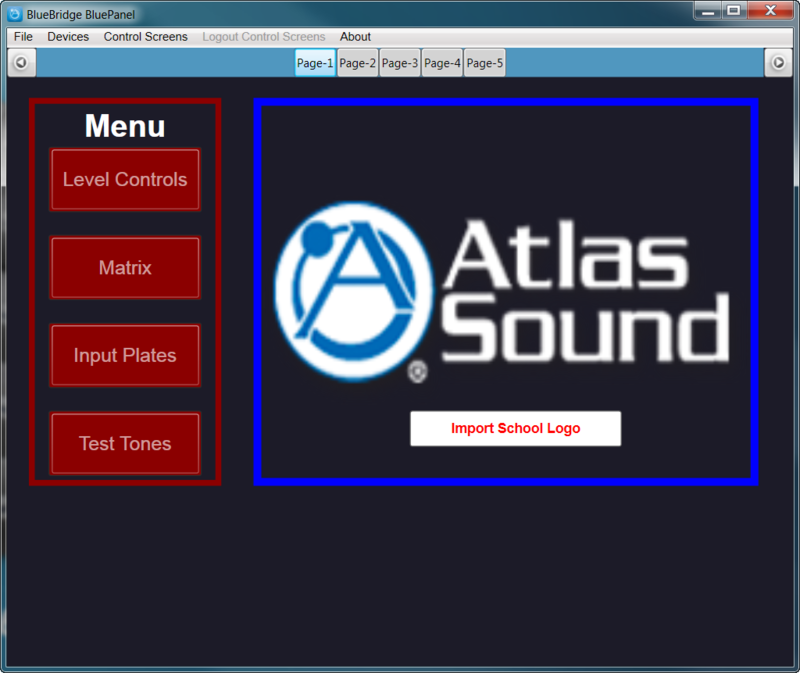 AtlasIED offers hundreds of products that are designed to save you time and money. Below are application examples that illustrate the diversity of AtlasIED products and how they can be applied in scenarios integrators encounter everyday. 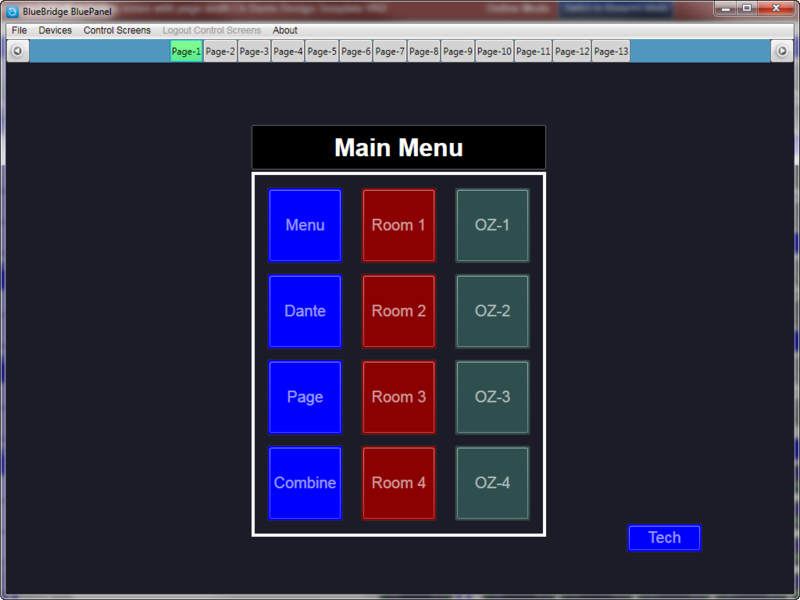 Click the headers below to find examples based on product category or venue type. 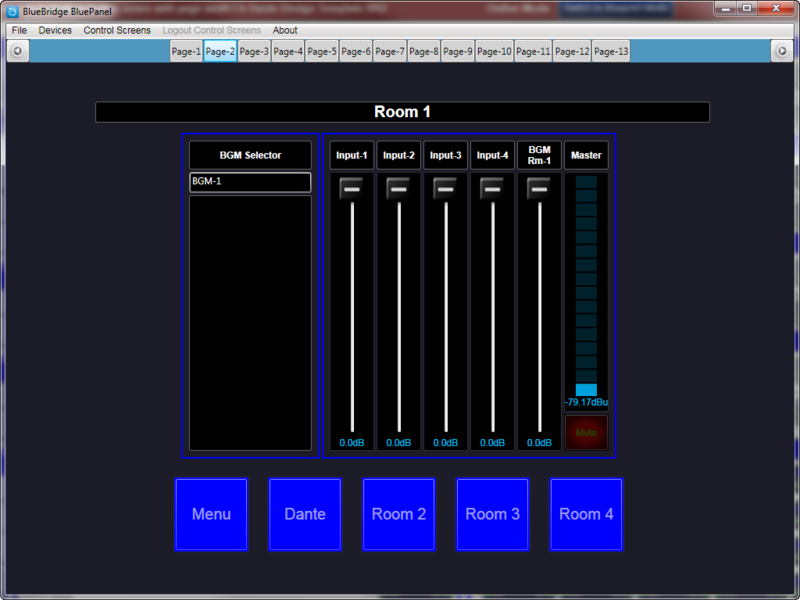 In this application a BB-168DT is deployed to manage four (4) ballrooms and four (4) additional zones of audio in a hotel. 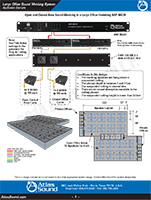 The BlueBridge® 16 x 8 processor allows matrix switching of the 12 mic/line inputs in the four (4) ballrooms, the three (3) BGM sources, hotel page, and four (4) wireless microphones on four (4) of the Dante™ network audio channels. 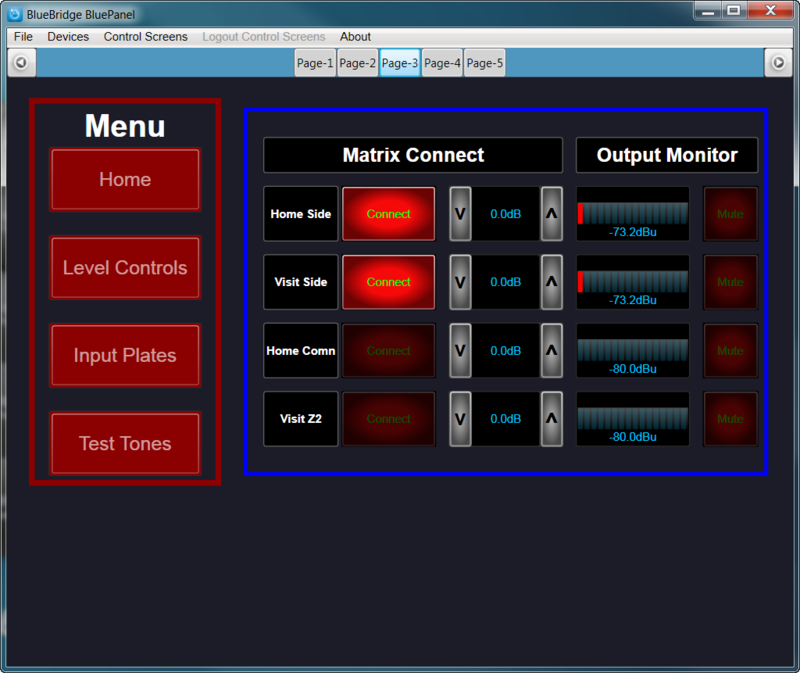 See below for BlueBridge® BluePanel screen shots. 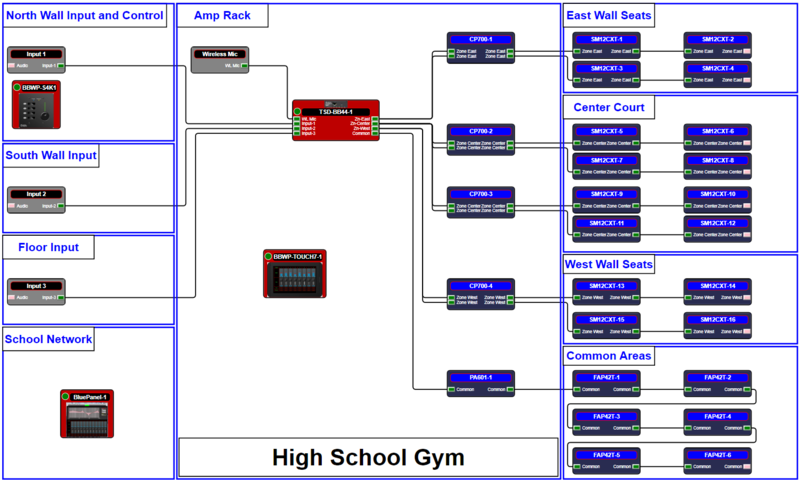 This example demonstrates the use of a BlueBridge® TSD-BB44 to control four (4) zones of audio in a high school gymnasium. 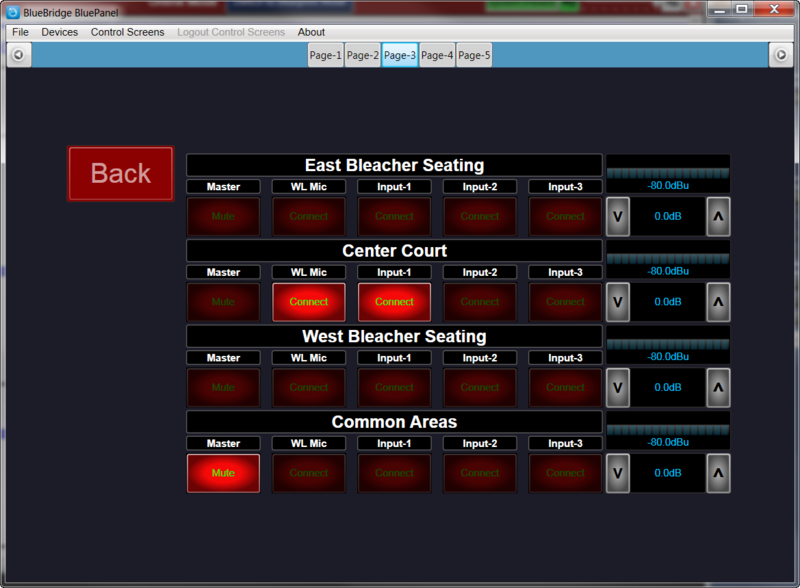 Three (3) zones control speakers in the gym for bleachers and center court with an additional one (1) zone for speakers in common areas including the lobby and locker rooms. The gym is primarily used for basketball games, practice, and assemblies. 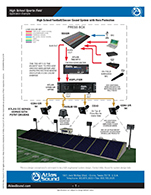 This example demonstrates the use of a BlueBridge® TSD-BB44 to control four zones of distributed audio; two zones for Home and Visitor bleachers and one zone for each of the two concession areas. This type of sound system requires careful management of sound coverage, reflections, and SPL to minimize echo, which reduces intelligibility. 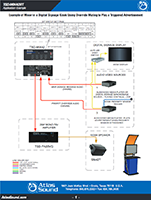 This example illustrates how to configure a TSD-MIX42RT in a Digital Signage Kiosk where a continuous loop is playing until a customer standing in front of the kiosk triggers a proximity sensor and a specific advertisement is queued to play. 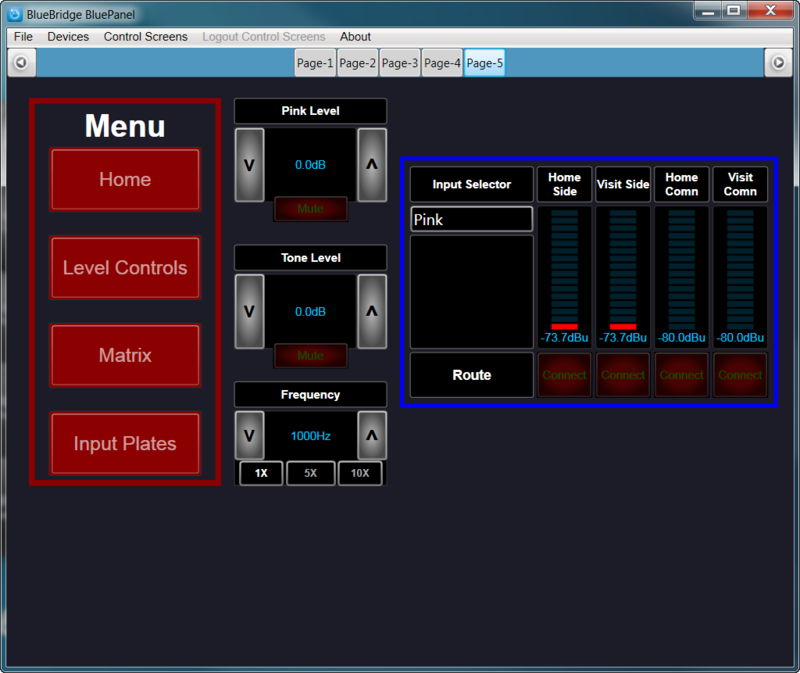 The TSD-MIX42RT Juke Box Override feature is used to automatically mute the continuous loop audio, play the second media player audio, and then after the audio stops revert back to the continuous loop audio. 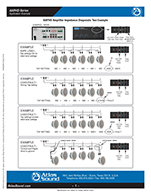 This example illustrates how to use a TSD-MIX42RT as a 3 Stereo Input source mixer in a system that requires selected channel muting when triggered by an Audio Source. 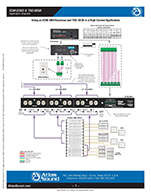 This example illustrates how to use a TSD-MIX42RT as a 3 Stereo Input source mixer summed to mono output, with a remote WPD-MIX42RT wall plate source selector. 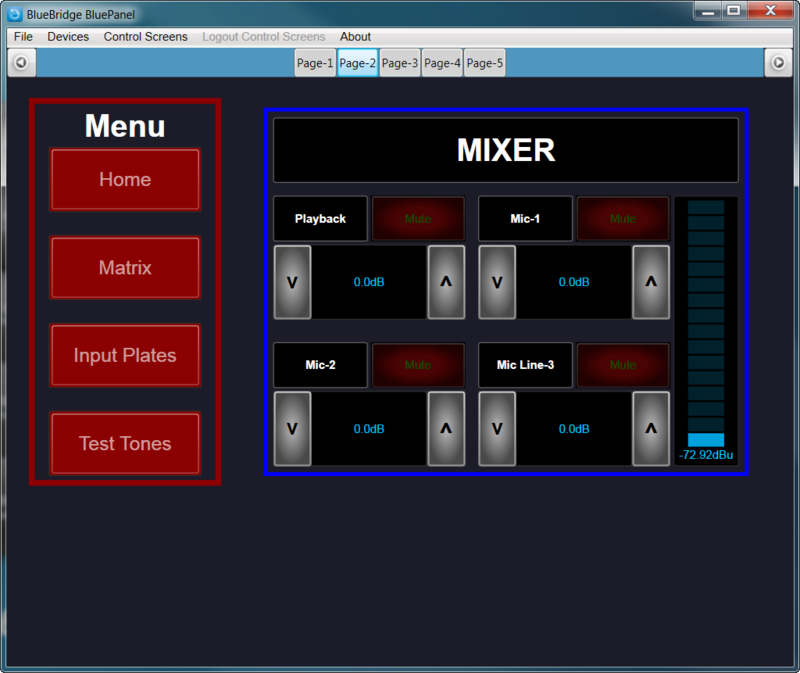 This example illustrates how to use a TSD-MIX42RT as a 3 Stereo Input source mixer in a stereo speaker system with a remote WPD-MIX42RT wall plate source selector. 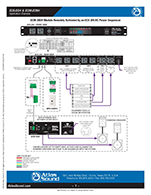 This example illustrates how to add a WPD-MIX42RT wall plate source selector to a TSD-MIX42RT in a 3 Stereo Input source mixer system with a paging Mic. 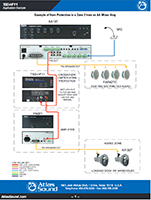 This example illustrates how to use a TSD-HF11 as a preamp/limiter to feed a secondary horn paging system in an existing 70V system using a TSD-TXHL speaker level to line level converter. 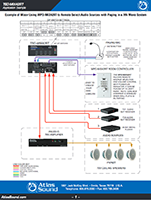 This example illustrates how to use TSD-HF11 as horn protection using the Pre Out / Amp In feature on an Atlas Sound AA mixer amplifier. 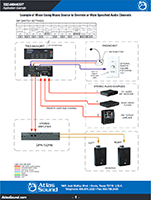 This example illustrates how to use the TSD-HF11 Crossover/Limiter for speaker protection in a secondary (Zone 2) horn paging system. 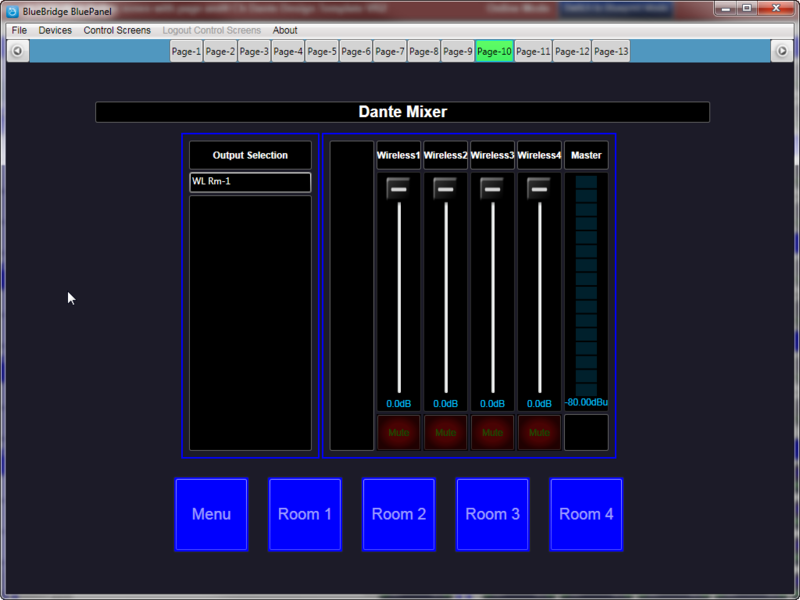 This example illustrates using a WPD-RISRL to remotely control the volume and individually select three audio sources using an AA50PHD mixer amplifier in a 70.7V speaker system. This example illustrates an AA50PHD amplifier connected to a 70.7V speaker system with various tap settings, or load conditions, and how the PHD fault indicator responds. 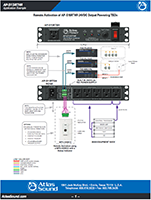 The AP-S15RTHR half width rack design offers power management control, remote activation, 24VDC 2000mA outputs, noise filtering, spike/surge protection and six AC outlets making it the most compact, cost effective power management protection system on the market today. The ECS-3 and ECM-15SH can be effectively deployed to protect electrical equipment is house of worship or other live speech/music venues. 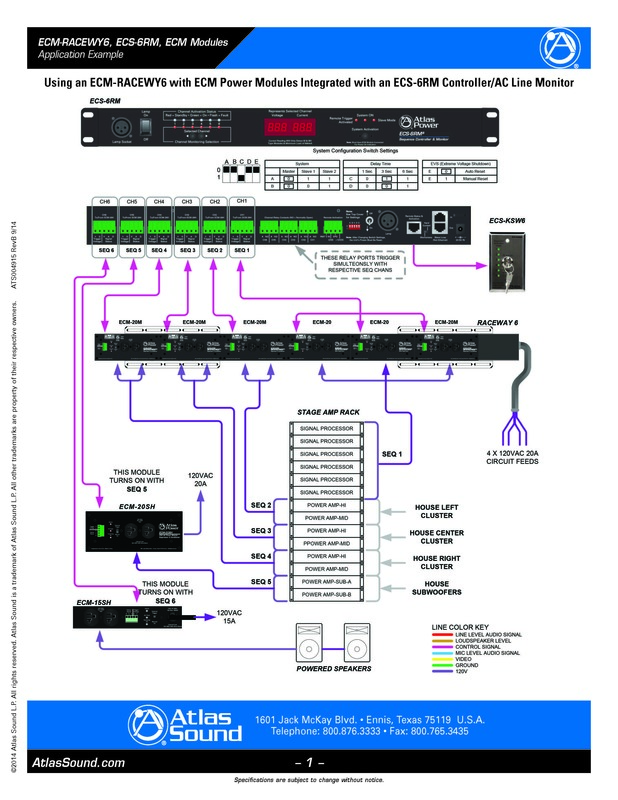 This example illustrates a Front of House system rack containing the main mixing console, signal processors, matrix A/V switcher, media player, and 70V mixer amplifier all plugged into an ECS-204 power sequencer. 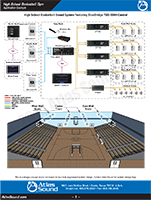 Additionally, the main on-stage powered speakers are connected to a single remote ECM-20SH power module that is also plugged into the ECS-204. In this example, one ECS-204 electrical sequencer in a Front of House system rack (master) is linked to a second ECS-204 (slave) electrical sequencer mounted in a stage equipment rack. 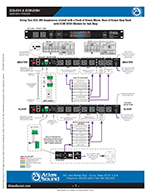 This example illustrates the use of a TSD-SEQ6 to sequence the power outlets on an Atlas ECM-2063 for an on-stage amp rack. The ECM-2063 features a total of 12, 120VAC outlets that are divided into 6 sections. 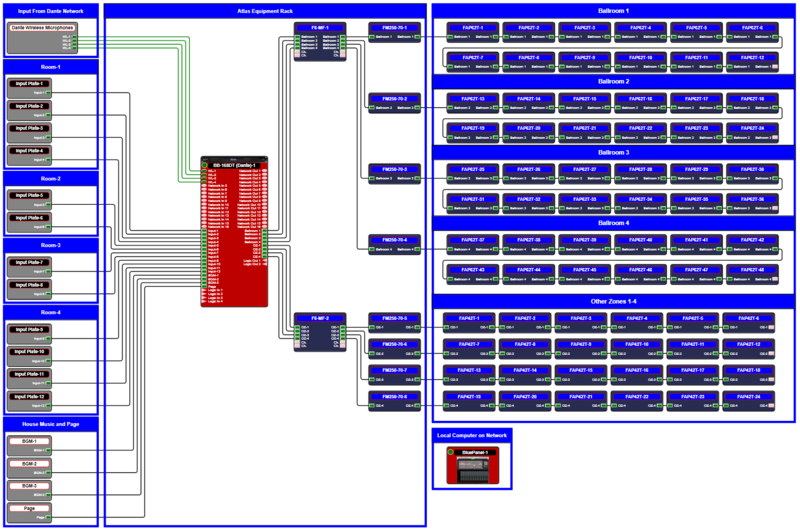 This example demonstrates the flexibility of using the ECM-RACEWY6 chassis with various ECM modules integrated with an ECS-6RM sequencer. 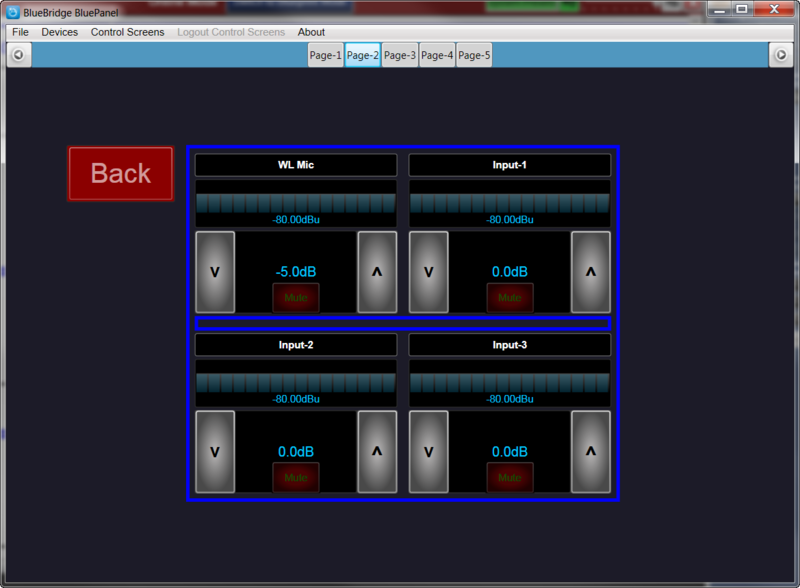 This example uses an equipment rack with six assorted signal processors (low current draw) and eight power amplifiers (higher current draw). 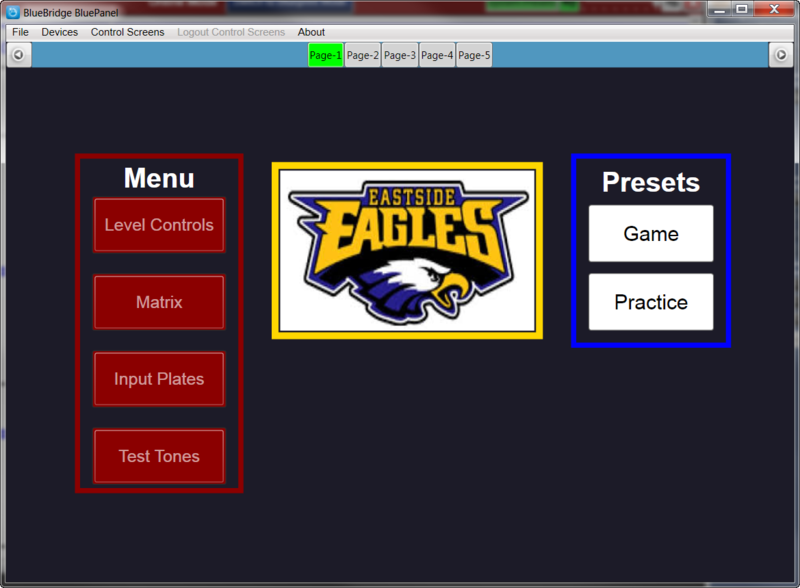 Two remote ECM modules are also integrated with the control sequencing and monitoring. 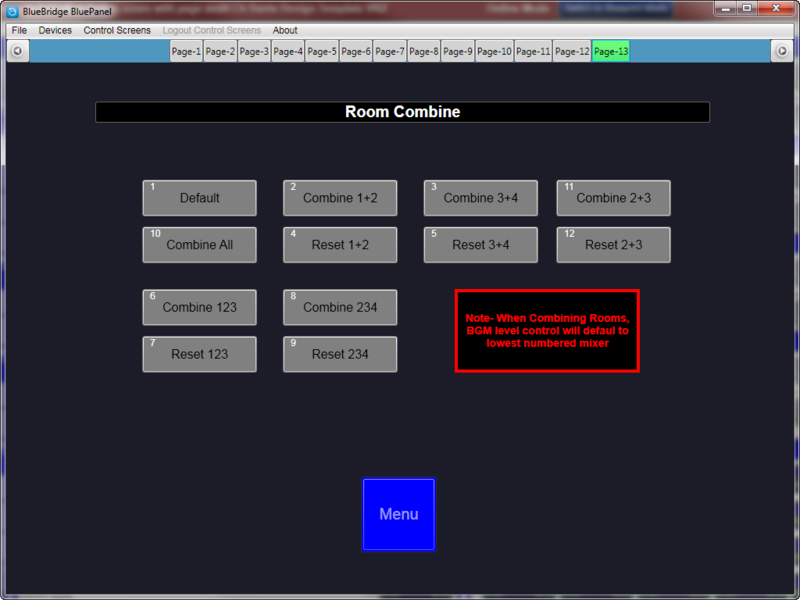 In this example, the ASP-MG24 (4-channel masking processor) is deployed to provide the two different specific filter curves necessary for the open lobby and hallways and closed exam rooms. 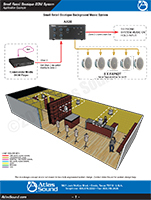 The exam rooms use a TSD-PA20VG amplifier powering ten (10), M1000 speakers set at 1-Watt each with a master level set by an E408-100 (stepped) volume control. 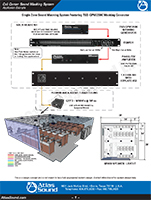 The open lobby and hallways have a TSD-PA20VG amplifier powering nine (9) M1000 speakers set at 1-watt each with a master level set by an E408-100 (stepped) volume control. In this example, the TSD-GPN1200K is deployed to provide a basic masking noise signal fed to an EQM131. 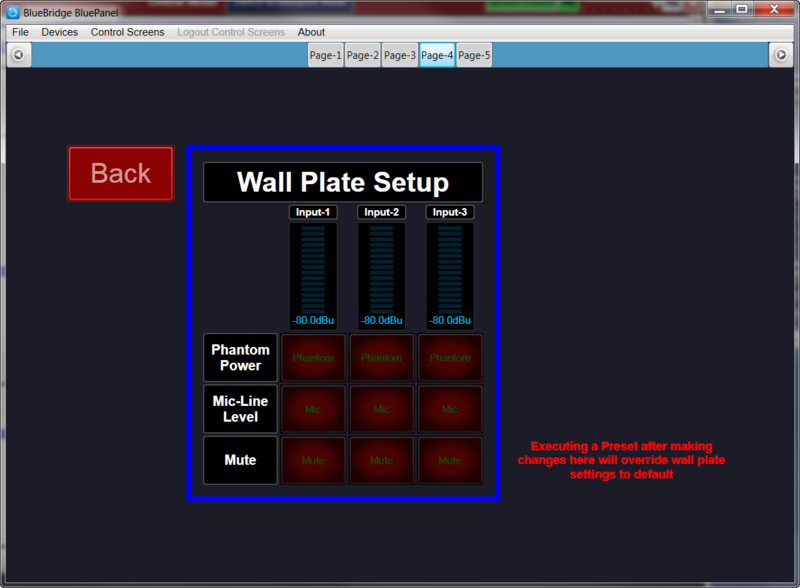 The 1/3 octave equalizer is used to enhance specific frequencies to establish the desired “Open Office” curve. 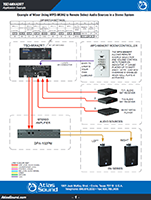 The TSD-GPN1200K is connected to nine (9) M1000 speakers, tapped at 1-Watt each, suspended in the plenum space being powered by a PA40G amplifier with master level set by an E408-100 (stepped) volume control. 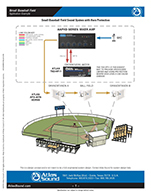 This application example illustrates the use of Atlas Sound CD horns with PD series compression drivers, CP series amplifiers, and the TSD-HF11 being used in conjunction with a mixing board and various inputs in an athletic field environment. 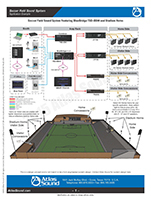 In this instance the TSD-HF11 protects the horns from damaging low frequencies output from music or announcer voices. 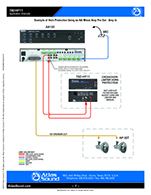 This application example illustrates the use of Atlas Sound APX-40TN horns, an AAPHD series amplifier, and the TSD-HF11 being used in conjunction with an announcer's microphone. In this instance the TSD-HF11 protects the horns from damaging low frequenices output the announcer's voice. This application example illustrates the use of an Atlas pole mount amplifier with FAP in-ceiling speakers, remote volume control, and TSD-MIX31RL in a training room application. 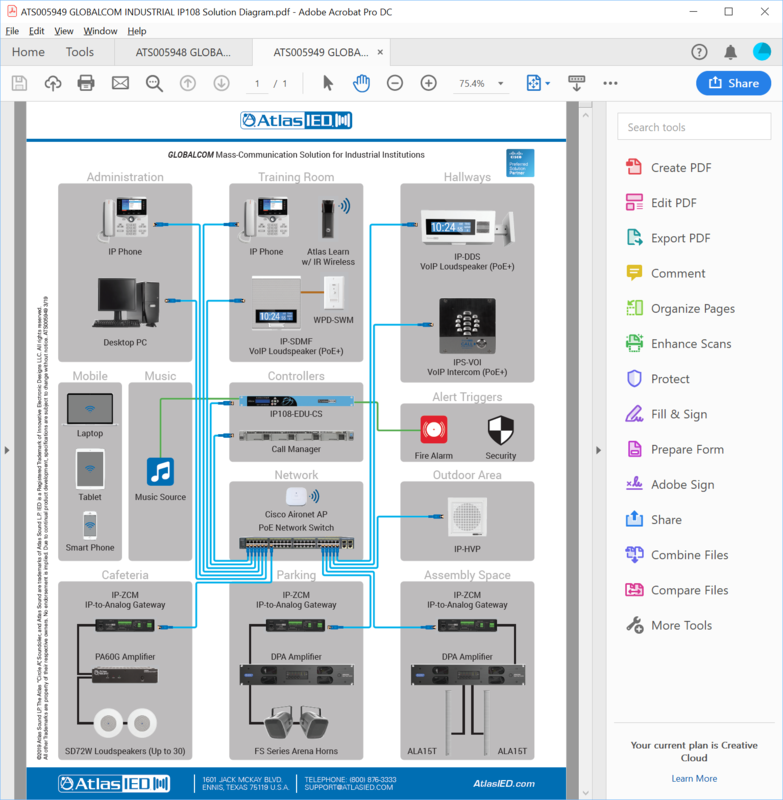 This application example illustrates the use of an Atlas pole mount amplifier with SM series surface mount speakers, TSD-MIX42RT, and remote input wall plate selector in a training room application. 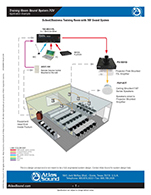 In this example, the ASP-MG24 (4-channel masking processor) is deployed to provide the two different filter curves necessary for the open cubical and closed office spaces. The two open cubical areas feature a PA1001G amplifier powering thirty-two (32) M1000 speakers, tapped at 1-Watt each, for a total of sixty-four (64) speakers with a master level set by an E408-100 (stepped) volume control. 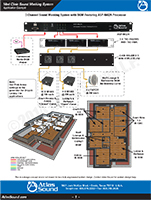 The closed offices use a PA1001G amplifier powering fourteen (14) M1000 speakers, tapped at 1-watt each, with a master level set by an E408-100 (stepped) volume control. The M1000 speakers are suspended above the ceiling tiles in the plenum space. 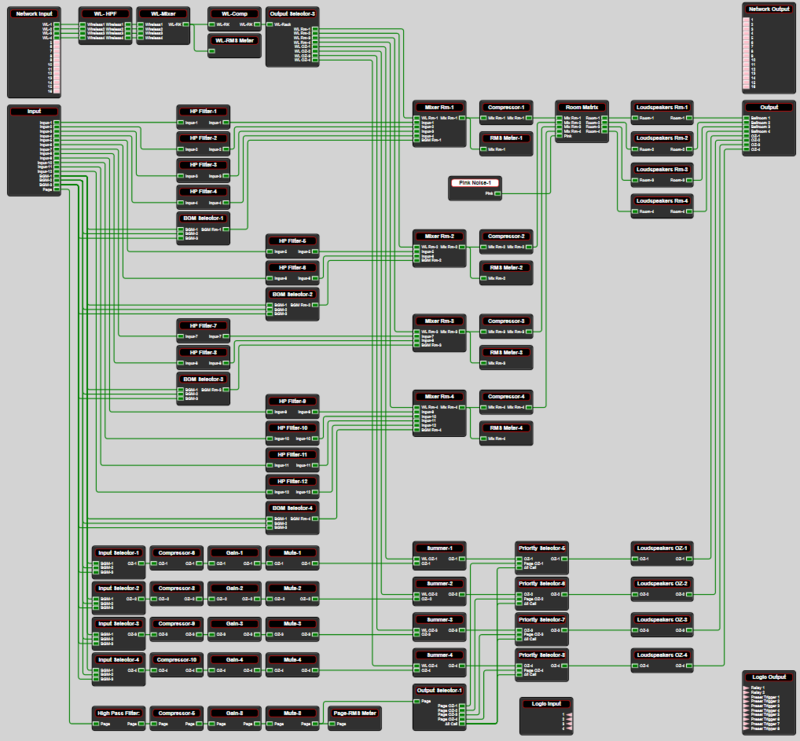 In this example, a commercial media player provides the music source for an AA35 70V amplifier. 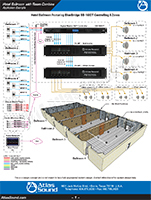 The amplifier powers five (5) FAP62T speakers mounted in a suspended tile ceiling with each tap setting at 4-watts. 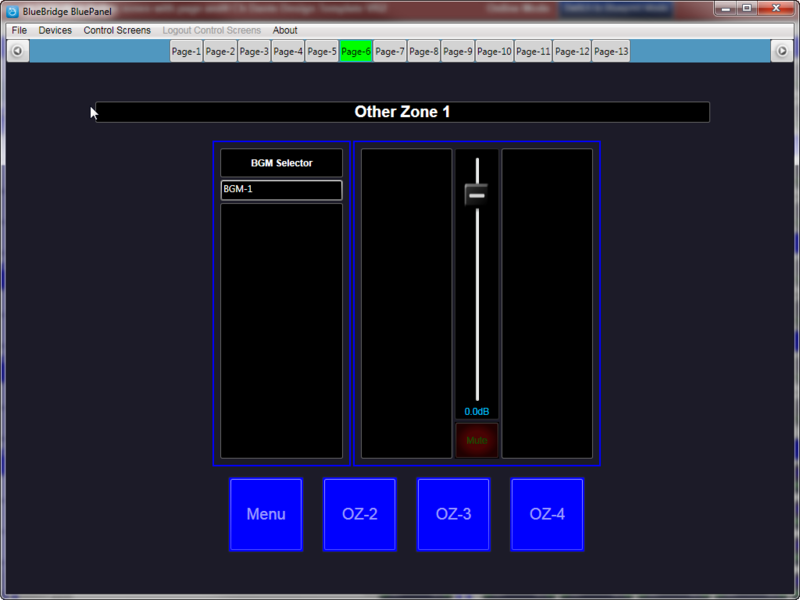 Using the rear panel dipswitches, select the zone-2 source to use channel 2 (music) and the output is then connected to the MOH (music-on-hold) phone system input and adjusted for clean sound. In this example, a commercial media player and countertop-paging microphone provide two sources for an AA35 70V amplifier. The AA35 powers five (5) PM4FA-B pendent speakers suspended from a plaster ceiling with each tap setting at 4-watts. The rear panel dipswitches allow the zone-2 source to use channel 2 (music) and the output is then connected to the MOH (music-on-hold) phone system input and adjusted for clean sound. 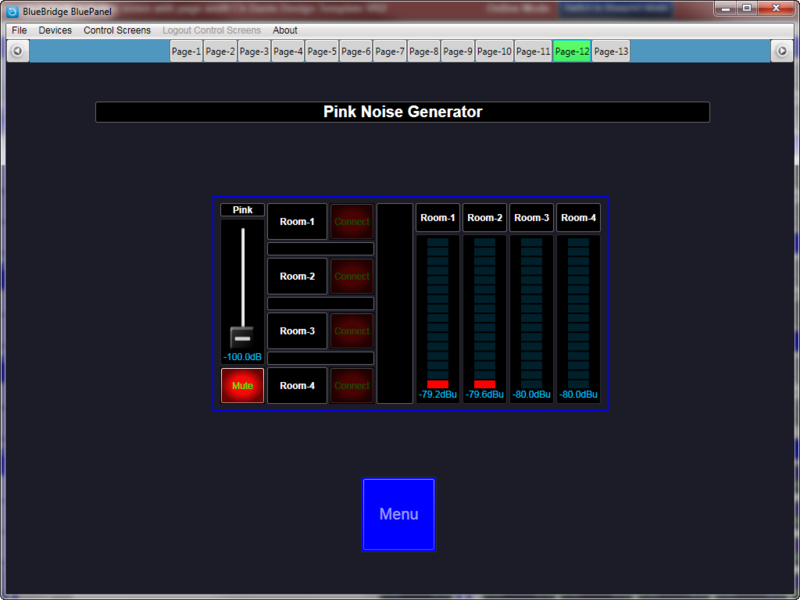 In this example, a single commercial media player feeds a music source to a single PA1001G 70V 100W amplifier. 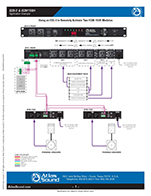 The output feeds six (6) AT35-RM volume controls mounted in a single 2U ATPLATE-052. 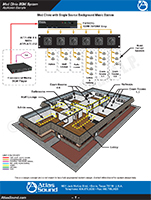 The volume controls feed FAP62T 70V speakers mounted in a suspended mineral tile ceiling in six (6) zones: Administration, Staff lounge, Bathrooms, Lobby & Hallways, Exam Rooms 1-3, and Exam Rooms 4-6. Volume levels can be set for each of these zones as desired. 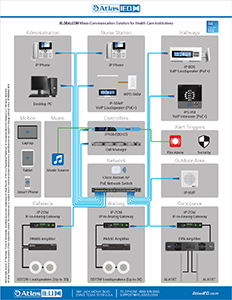 This diagram illustrates a mass communications solution for a healthcare institutions. 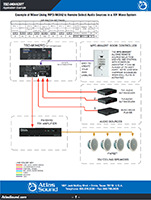 It incorporates the IP108-EDU-CS controller to manage the flow of announcements and messages between network endpoints, such as digital communication stations, zone controllers, network power amplifiers, and IP-based speakers and endpoints. 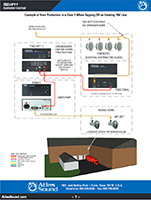 This diagram illustrates a mass communications solution for industrial locations. 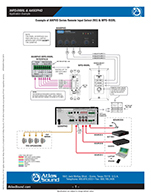 It incorporates the IP108-EDU-CS controller to manage the flow of announcements and messages between network endpoints, such as digital communication stations, zone controllers, network power amplifiers, and IP-based speakers and endpoints.